Gram has elevated one of his blankets above all the rest. When he finds it, he buries his face in it and sits still for a few seconds, and stillness is not ordinarily one of his virtues. 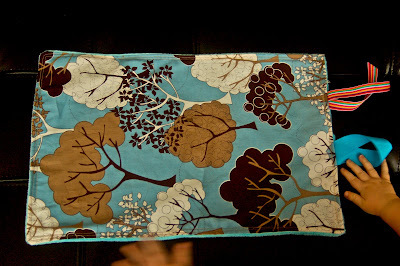 We had the blanket custom made by Javis Davis, a great small company that has advertised on Sweet Juniper in the past, with a cool geometric pattern on one side, and this soft, almost furry, fabric on the other. 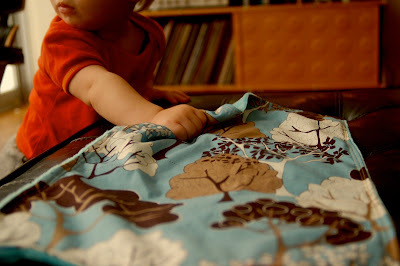 It's this fabric (Javis Davis calls it "fluff turquoise") that Gram loves so much. I guess this blanket is his security object. Juniper never really became attached to an object this, but Gram already has a visible response when he sees his blanket. 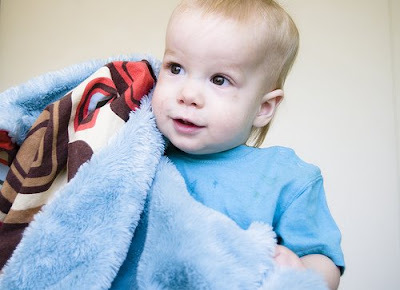 The blanket is too big for him to carry around though, so I decided to create a smaller version out of a similar fabric for him to lug around wherever he wants. I added some ribbons for Gram to play with. The ribbons also make it easy to tie it onto a stroller or hook to his car seat straps. Juniper uses the ribbon loop on hers to carry it around on her wrist. I doubt that Gram will ever be attached to the little blanket the way he is to the real thing, but it was fun to make and I was really pleased with how it came out. Major fabric stores usually carry some fabric like this in the baby section. I found mine in my favorite specialty quilt shop. It's pricey -- I bought a quarter of a yard for $9.00. 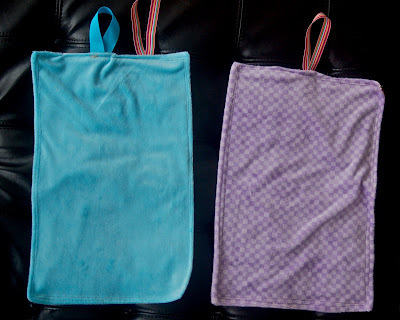 The one I used for Juniper is the same texture but has a purple checker pattern. Once you have the fabric you want to use, cut a rectangle of your desired size from each fabric (I did about 9 inches wide and 18 inches long). Put the right sides together (wrong sides out), and stitch along 3 sides. On the fourth side, sew a few inches in, but leave the middle portion unsewn. Then turn the material right side out. If you want to add ribbon, this is where you do it. 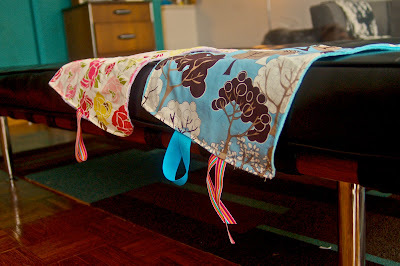 Place a length or a loop of ribbon inside the unsewn edge, and then tuck the edges in so that it matches the rest of the blanket. Sew along the fourth edge, making sure to seal the raw edges inside. Finally, stitch all the way around (all 4 sides) on the right side. 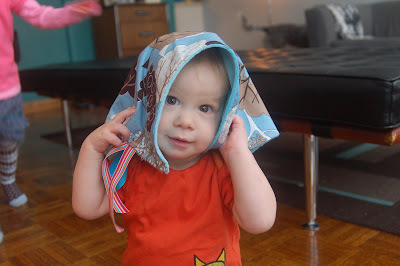 I actually did this twice -- I sewed a 1/4 seam around once, and then sewed again inside that seam.